Summer is not just for road trips and sunny vacations. It’s also the perfect time to give your home a tune-up. While there are many projects to consider, prioritize those that will prepare your home for the storms and snow to come. If your roof is in a state of disrepair, now is the best time to patch it up. Schedule a professional inspection to identify potential problem areas and address them right away. This dry season ensures that contractors can handle any roofing work without worry of exposure to rain or hail. As the expert in roof repair in Des Moines, we offer prompt and professional services to restore your roof. We are equally adept at roof replacements, whether it’s just a small section or the entire thing. They are like the lifeline of your roofing system. As such, a problem will often involve your roof, and by extension, your home. If your gutters are full of leaves, twigs, and other debris, you will need to clean them out to avoid moisture damage and ice dams. If they are already sagging or look like they have been through hell and back, you might want to consider replacing them. Judging by the winter pattern over the past two years, you cannot afford to go with haphazard gutters. We install custom-fit gutter systems, feature high-tech aluminum alloys and durable, smooth surface finishes, to resist tough corrosive elements and UV radiation. This is one of the best ways to reduce energy loss in your home and prevent the formation of ice dams on your roof. 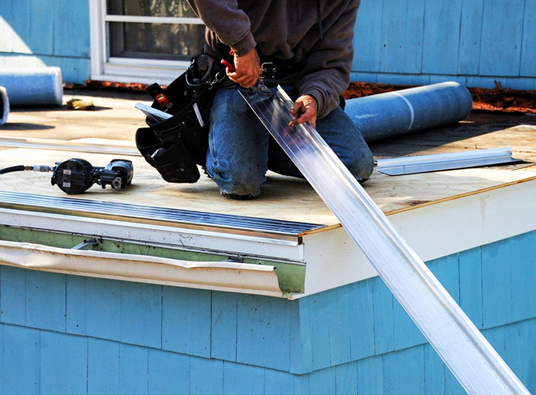 We install blown-in insulation that is far better than the usual rolls of fiberglass batting. In addition, our Solar Blaster™ will keep the area well ventilated and moisture free. This way, your home will be better prepared for the extreme temperature changes ahead. Let the expert in residential and commercial roofing in Auburn work with you this summer to spruce up your home. We work with leading industry brands, such as GAF®, CertainTeed®, and Owens Corning® to provide you with the best products on the market. Call us today at (877) 212-9355 or fill out our request form for a free estimate on your summer home improvement needs.